I reckon this has to be one of my favourite shots of Rachel and David Ellershaw’s beautiful Georgian cottage, as seen in this month’s Period Living. It’s an amazing transformation! Just loved sharing this super couple’s story. Photo, courtesy of Jeremy Phillips. One of my favourite Andreas von Einsiedel photographs from our festive shoot at the enchanting home of Carrie Brixey, which is featured in this month’s issue of The English Home. It’s been so lovely to receive such kind feedback about both articles in the magazine and to hear that so many people have dashed out to buy it. How fantastic. Thank you! So thrilled that two of my festive articles are featured in this month’s sparkling issue of The English Home, including the front cover story! The coverage and very kind feedback from homeowners Carrie Brixey and Loraine Gabb have been so lovely, while the shots, taken by colleague Andreas von Einsiedel are simply beautiful. 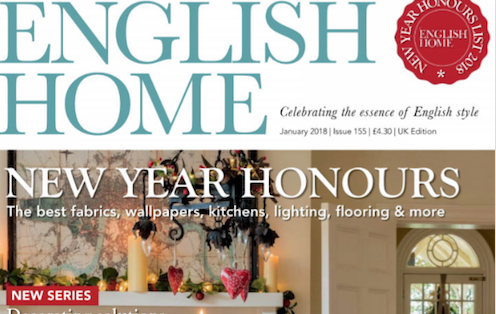 If you haven’t picked up a January issue of The English Home yet, it’s on the shelves right now. Another stunning day in West Sussex…hard to believe it is so very mild, considering it’s the first day of November. Long may it last! 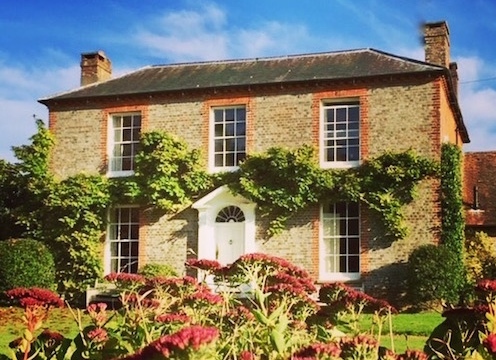 This elegant house caught my eye recently when I was out and about on my travels – isn’t it just beautiful? If you love your home and would like it featured in one of the magazines I write for, drop a line to mail@janetmcmeekin.co.uk or give me a call on 01243 792379. Happy Monday! There’s a definite autumnal feel to my features in this month’s (October) Country Homes & Interiors and Ideal Home magazines. Such lovely commissions and fabulous folk. 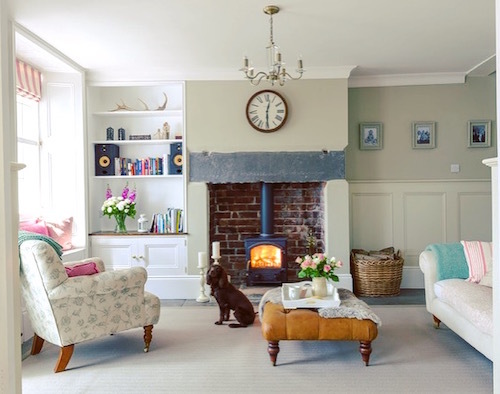 Just loved meeting Pauline and Paul West at their stunning Victorian home in Plymouth, which simply oozes personality and character. It was also terrific to spend time with Sarah Quinn and her brother Lorcan, during a trip to Northern Ireland. The pair run Enrich & Endure, a thriving company that sells beautiful linen aprons and napkins. Photo of Pauline’s home, courtesy of Andreas von Einsiedel. 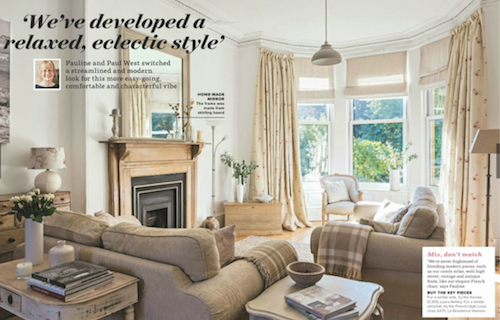 Little sneak peek of my feature inside the latest (September) issue of The English Home magazine. The moment that photographer colleague, Andreas von Einsiedel, and I arrived at the enchanting home of Maureen Dew, who runs Smoke and Mirrors Styling, it was all hands on deck, to ensure the shot on the right was taken while the light was perfect – and before it started to pour! 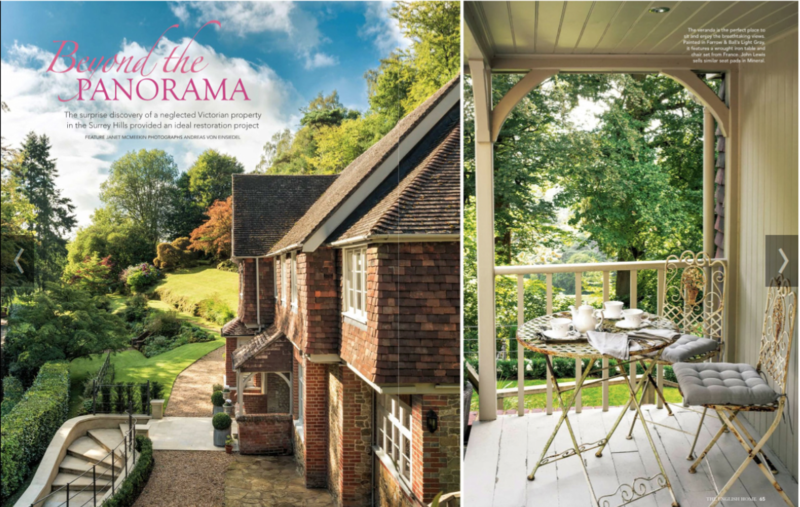 Huge thanks to Kerryn Harper-Cuss at The English Home for such fantastic coverage in the new (September 2017) issue, which features stunning shots, taken by photographer colleague Andreas von Einsiedel – and my words. It was such a pleasure to visit the absolutely beautiful home, owned by Maureen Dew, of Smoke and Mirrors Styling, for our shoot in the Surrey Hills, and to write about the restoration of this previously neglected Victorian house, with its elegant French-style furniture from La Residence Interiors. 1. Q: Has the move towards open-plan kitchen/dining/living spaces enriched family life? A: When you look back over the years, (and I’m thinking about big, grand houses here) the kitchen was primarily an area used for food preparation. As time moved on, homeowners did more of the cooking and the kitchen became more important. As people became less formal, they began to entertain in the kitchen, rather than the dining room, and that space became more valuable. In recent years, there certainly has been a move to kitchen/dining/living, with families sharing the same space. As family life evolves, I think that it’s important for a house to be able to evolve with it. While children are young, they don’t want to be anywhere apart from the same room as you. However, as they get older that may well not be the case for them – or you! Ideally, you’d have the space within the house to let that process take its natural course. My personal opinion is that you don’t invite your friends round to watch TV, but you will watch it as a family. I feel that your TV room can be a snug where you can all cosy up on a winter’s night as a couple, or as a family, and – you don’t need a big room for that. If you want to invite people round and have a fun time with friends and loved ones, then the kitchen is where you want to be. Rather than kitchen/dining/living, I see it as kitchen/dining and a bit of casual seating, if you have got the space. 2. Q: What’s your set-up at your home? A: Our boys are now 11 and 13 and we’ve moved to a barn in Hampshire with a big kitchen. It actually does happen to have kitchen/dining/living and a television – but I’m personally not particularly enjoying having the TV in the kitchen! If I’m cooking or chatting, and the children have some noisy programme on, I don’t find that enjoyable. We don’t watch television when we are eating. I think we are a bit spoilt for space in our new house since we do have another television room that we can go to. In our previous house in London, we had the kitchen/dining with a bit of casual seating arrangement that I just mentioned. 3. Q: Have you got a favourite kitchen gadget? A: A very nice corkscrew! We also have a hot water tap in our kitchen, which I like. I do miss the food waste incinerator from our house in London, but, in saying that, we do now have chickens! 4. Q: What is the one thing that enhances a home’s saleability? A: Without question, I’d say the kitchen is the most important room to get right – and that’s not always easy. It is, however, the room that is going to sell your house. 5. Q: Have you any top tips for getting the kitchen right? A: I would take advice, and also aim to make the kitchen as up-to-date as you possibly can afford to do. A lot can be done to spruce up a kitchen, whether that’s re-grouting tiles, changing the handles or new cupboard doors, or fitting different work surfaces. If you are going to replace a kitchen, it’s a big outlay, but if you get it right, it should be an investment since you will enhance the overall value of the house. However, if you spend a lot of money installing a new kitchen and somebody walks in and likes the house but not the kitchen, then they may think ‘Oh, it’s a new kitchen, I can’t rip that out.’ That’s why it can be a tricky one, and why it’s worth getting some advice before doing anything. 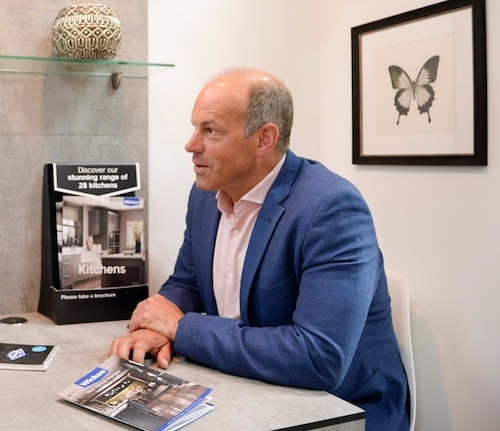 There is a difference between fitting a new kitchen in a ‘forever home’ and fitting one when you are thinking that you may sell. You need to be mindful of where you sit within those scenarios. 6. Q: Have you any predictions about the style of kitchens in the near future? A: Kitchens are similar to bathrooms in that they follow fashion and that there are always new trends emerging. At Wickes today, I’ve seen a lovely matt, rather than gloss, kitchen. The ability to keep matt kitchens hygienic and clean has greatly improved, and I think we’re going to see more of that. 7. Q: What are your funniest/most unexpected moments on Location, Location, Location over the years? A: That’s quite a difficult question because something funny or unexpected happens frequently. 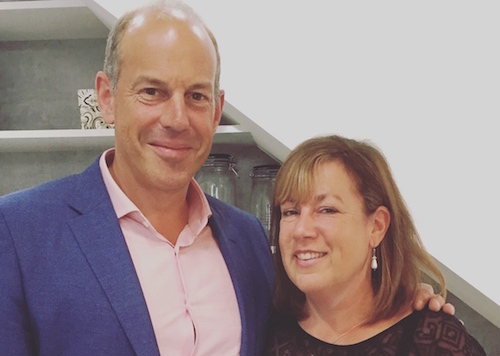 Kirstie and I really enjoy making the programme – if we didn’t, we couldn’t have done it for 18 years. It is a fun process to be involved in. It’s also a serious process because people are spending life-changing amounts of money, but our attitude has always been that it’s the biggest shopping expedition of your life, and you should be able to enjoy it. If our house-hunters are enjoying themselves and we are showing them good houses and learning as we go along, they relax because they know we care, that we’ve listened, and are doing our best. If it’s all going well, they tell us more, which enables us to do a better job, and then Kirstie and I enjoy it all the more. Most weeks there is a moment when everyone is roaring with laughter so much that we have to put the camera down – it happens! 8. Q: What’s the show’s secret of success? A: It’s very different to anything else on the television. It is not a makeover show. It’s about genuine people with genuine problems, spending huge amounts of money and, therefore, there is a serious element to it. We don’t rehearse the show and we don’t know what our house-hunters will think – it’s very real. The story happens in front of us. If we are having a nice time, you’ll know about it and, if we aren’t, you’ll also know! 9. Q: Do you socialise with Kirstie off-screen? A: We were out to dinner with our business partners a couple of nights ago and even ended up dancing – although, that doesn’t often happen. We have a real friendship. 10. Q: What’s your new home in Hampshire like? A: Some of it is a barn conversion and some of it is new-built, in a barn style. A genuine barn conversion often comes with some compromises, usually to the bedrooms. One of the reasons I like where we are is that it’s an old farmyard. There are old barns – but a lot of the living accommodation is built in a barn style. We’ve got barn style without barn compromises. It’s got lots of glass, beams and high ceilings. 11. Q: Where would your dream home and location be? A: Architecturally, my dream home would be a Queen Anne, beautifully-proportioned, symmetrical house, but I’m actually really happy where I am. Our home is big enough for the four of us and some pets, and I feel the ‘dream’ Queen Anne house would be too big to live in and a noose around the neck. My dream location would be Byron Bay in northern New South Wales, Australia. Byron Bay is my favourite place in the world. My wife is Australian, we’ve spent a lot of time in Australia, and we got married there. I’ve been a regular visitor to Byron Bay for 15 to 20 years. It’s a beautiful bay with warm water, good surf and lush greenery that comes down to the white sand. It’s a bit hippyish, surfy and relaxed. 12. Q: How much more difficult is it for people to make money by developing properties these days than it was 20 years ago? A: I wouldn’t say it was easy then, but there was easy money out there. Nowadays, you have to be much more strategic about what you buy and where you buy, and you’ve really got to know what you’re doing. Previously, you bought a property, owned it and it went up in value. Quite often, most of the climb was down to the market, rather than you. You do have to think it through very carefully now, and the costs of buying and selling have hugely increased. 13. Q: What advice would you give to anyone who wants to get on the property ladder these days? A: Look for any opportunities to add value, whether that’s renovating, installing new kitchens and bathrooms, or extending. Look for an up-and-coming area. Try and buy a property that will last you for as long a time as possible. If you’re in your twenties, recognise that life changes rapidly and choose somewhere that can cope with those changes in your lifestyle. If you’ve been able to add value to a property, then that’s even better! Thrilled to receive such positive feedback, following the publication of my interiors feature in this month’s (August) Country Homes & Interiors magazine. 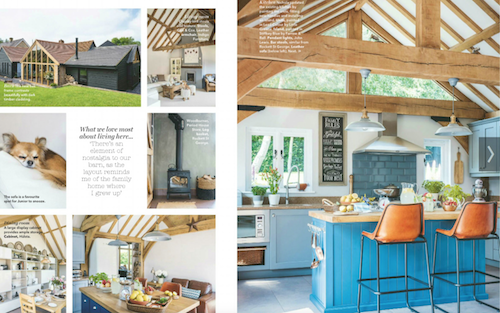 It was such a pleasure to style this fabulous barn conversion with plenty of summery touches, and to write Nichola Trayler-Barbrook’s story. 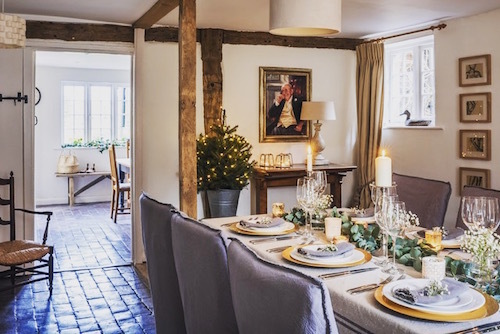 I love how Nichola has stylishly transformed this beautiful oak-framed kitchen in her Hertfordshire barn conversion with a fresh lick of paint, new handles, an island, and a pair of gorgeous leather bar stools. If you’d like your own home to be featured in one of the national magazines I write for, drop me a line at mail@janetmcmeekin.co.uk or call 01243 792379.